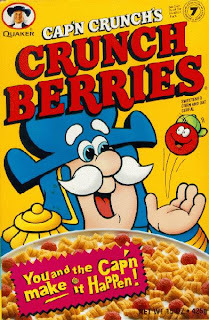 In a previous entry in the Gallery of the Absurd, I wondered about the possible double entendre found on a box of Cap'n Crunch. Today, I'd like to revisit that line of thought. Now here is a Cap'n Crunch box I recently found in the grocery store. 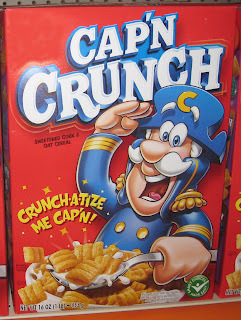 The appeal on the front is for the Cap'n to "crunch-a-tize" you. Also, notice where the Cap'n is holding his spoon and what appears to be bursts coming from that area. Parents, do you know what your kids are eating for breakfast?